Looking for a different summer side dish? This fresh summer salad is like a cucumber melon salad on steroids thanks to a spicy kick from serrano peppers and salty queso fresco. Melon Cucumber and Jicama Salad is perfect for summer barbecues and picnics. a) running through the sprinkler or dousing yourself with the garden hose. 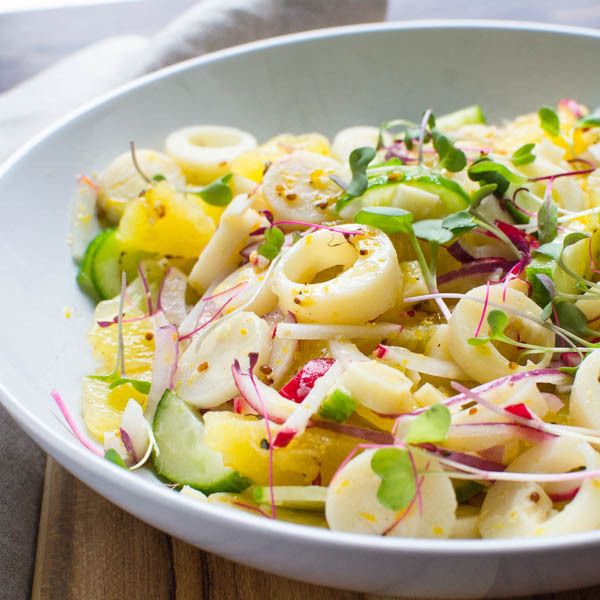 c) keep a steady stream of cool salads at the ready like this Melon Cucumber and Jicama Salad. I choose d) all of the above. You’ll like this one, it’s crisp and cool with musky sweetness from ripe cantaloupe and juicy watermelon. Jicama and cucumber add additional crunch while keeping the flavors neutral. I added thinly sliced red onion and spicy pepper for heat, but before you add a peck of peppers, I recommend knowing your audience. I don’t mind the burn, but I learned that my daughter does. She picked out most of the serranos. Live and learn. Crumble in some mild queso fresco for a salty bite. An agave lime dressing melds the flavors together. Gently toss the fruit and vegetables with the dressing, add fresh herbs and serve. This fresh summer salad is best when eaten soon after making it. If you make it too far in advance, the fruit will give up too much of its juice and puddle in the bottom of the bowl. I used fresh mint to finish the salad, but basil would work well too. Serve as a fresh, tasty side for summer alfresco dining with grilled chicken, pork or seafood. This is a great summer salad when the heat and humidity are oppressive! Juicy, sweet melon, crisp cucumber and crunchy jicama with a little tangy cheese and a light dressing. Best served cold! Adjust the heat factor to your taste by removing the seeds and interior membrane for less heat or keep them for more - but watch it, it can get fiery. What a neat way to use jicama!